Eagle Scout Brian Siboczy helped get Burlington Township recognized as an official osprey migration location by the New Jersey Audubon Society. 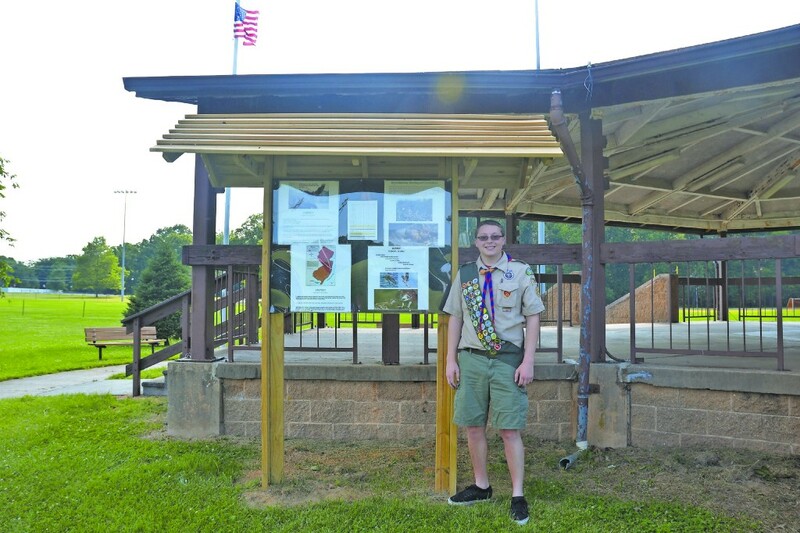 Eagle Scout Brian Siboczy stands with the kiosk he built and installed in Green Acres Park in Burlington Township on Tuesday, June 13. Siboczy said the goal was to create a display that would inform people about the osprey nests taking up residence in Green Acres. For Burlington Township High School senior Brian Siboczy, obtaining the rank of Eagle Scout has been a goal since childhood. As a member of Boy Scouts of America’s Troop 764 in Burlington since childhood, Siboczy said he has enjoyed everything involved in the Scouts including camping, learning wilderness skills and the leadership opportunities. He said for that reason, he knew he wanted to achieve the Scout’s highest honor before aging out of the program. To obtain the rank, a Scout must initiate and execute a service project that benefits the community. Siboczy, who plans to study engineering at Rutgers, designed and built a kiosk at Green Acres Park displaying information about the local ospreys that build their nests there. He said as a result of his Eagle Scout project, the New Jersey Audubon Society has recognized Burlington Township as an osprey location. When Siboczy set out on his journey to Eagle Scout this year, he said he knew he wanted to build something. He remembered visiting Green Acres with his mother, Councilwoman Patricia “Trish” Siboczy, and seeing her fellow Councilman E.L. “Pete” Green taking photos of the osprey in the park. Through his discussions with Green, Siboczy learned it had been the councilman’s longtime hope to have Burlington Township recognized by the Audubon Society as one of the locations in the area that is home to ospreys. He said in the past, Green reached out to the society several times, but his requests were denied. With that in mind, Siboczy decided he wanted to create something that would get people in the community looking up. He said ospreys fly around the park all the time and create their nests in light posts, but most people don’t notice them if they don’t look up. He said he wanted to help Green spread awareness about the birds. Siboczy said constructing the informational kiosk was a daunting task with a lot more moving parts than he initially realized. He said all of the materials for the kiosk were acquired through donations, and tasks — such as checking for water and electrical lines — would pop up, complicating the project further. On the day in March they had finally planned to install the kiosk, it snowed, Siboczy said. Both younger and older Scouts came to help him with the construction of the kiosk. He said the process was a long one, with the structure finally going in the ground at the end of March, and Siboczy getting recognized as an Eagle Scout following the Scout’s Board of Review on June 5. Green supplied the photos and information for the display. Siboczy’s father, Ben, said the family has received a positive response from community members. Ben said many of those who have reached out have been shocked to learn there are osprey in the park. Both Ben and Trish said while their son would run ideas and emails by them, they left the planning and execution of the project solely in his hands. They said they’re proud of their son for bringing everything together. Siboczy said now that the kiosk is installed and the Audubon Society has finally recognized Burlington Township as result, in part, of the display, he’s working with the Audubon Society to get pamphlets to add to the kiosk for people who want to learn more about the birds. “I’m really happy I was able to make a meaningful contribution to my community that will last a long time,” Siboczy said.